Dr. Olivier Le Cour Grandmaison. DR.
Mohsen Abdelmoumen: You wrote « Coloniser. Exterminer« . In your opinion, was Algeria a colonial laboratory? Dr. Olivier Le Cour Grandmaison: Yes, we can indeed consider that Algeria has been a kind of laboratory for the elaboration of a certain number of techniques of war that can be described as counter-revolutionary war and repressive techniques, particularly after the appointment of Bugeaud as governor general of Algeria in 1840. 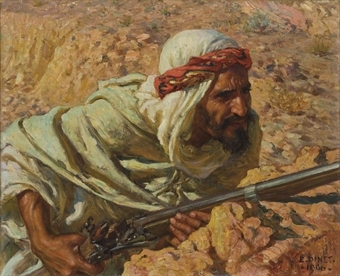 The purpose of the appointment is to carry out what the military and political leaders of the time have already called « the pacification of Algeria » and to do this, General Bugeaud will employ a number of methods of warfare and repressive techniques among which raids whose it must be specified that they sometimes lead to the destruction of entire villages and oases, the aim being to expel « indigenous » populations, as it is said at the time, and, as it is also very commonly said, to repress the « Arabs » to drive them out of the territories they occupied until now so that Europeans in general and the French in particular, the settlers, could settle in a « pacified » environment. Moreover, we know, and it is perfectly well established, that General Bugeaud has also contributed to the development of repressive techniques such as administrative detention and collective responsibility which will be used later under the Third Republic during the construction of the empire between 1881 and 1912 and finally during the last war of Algeria, from November 1, 1954 and until 1962. Senior officers of the French army will pay official homage to General Bugeaud, who they regard as a founding father of the colonial wars. I find there is a similarity between the fate of the Algerian people and that of the Amerindians. Do you not think that the two have undergone an extermination of State? First of all, until 1945, the term « extermination » is not at all synonymous with « genocide » which refers to mass killings. It is actually used by philosophers writers and by writers, I think in particular to Tocqueville who speaks indeed of extermination about the American Indians. I think to Émile Zola who speaks of extermination about the Commune of Paris. We can and we must also establish a parallel, which does not necessarily mean that everything is similar, but actually between the methods of colonial conquest developed by France in Algeria and the process of expansion of American democracy to the West of United States, in both cases, the indigenous populations were repressed, exterminated, i.e. massacred in mass and deprived of all or part of their territory. All your works are extremely interesting and referential. Thus, in your book « La République impériale« , you evoke the concept of the imperialization of institutions. What can you tell us about this concept? With regard to the concept of imperialization that I wrought, it was for me to report on the effects of the construction of the Empire on the Third Republic, thus between 1881 and 1912, on the political, academic and university institutions of the Third Republic, but also on the different sciences that have gradually emerged and in particular what will soon be called « colonial » sciences. We realize that precisely because France has quickly become the second largest imperial power in the world, it was necessary to set up a number of political and legal institutions in metropolitan France, whose function is to manage the territories and populations of the empire, and it was also necessary to develop a particular law, the colonial law, and develop singular and specific sciences, the so-called colonial sciences which are doubly colonial, a first time because they focus on the colonies and the people who live there, and a second time because basically, these colonial sciences are intended to help officials of the Third Republic to carry out the management of indigenous populations, as is said at the time. Do you not think that the Code de l’indigénat (note: Code of native) is an aberration? It must be remembered that the Code de l’indigénat was introduced in 1875 and was not really abolished until the Liberation (note: 1945) and that it is a code that brings together a number of discriminatory and racist exceptions. This is obviously very important to clarify because this code, as the name suggests, is only applied to Algerian natives, and later to only natives of the empire. It must also be remembered that its exceptional character, the contemporaries were perfectly aware of it since some of them, including those who were favorable to this code, named the Code de l’indigénat the « legal monster ». Because, indeed, it contravenes all the republican principles and all the democratic principles guaranteed and established in the metropolis but which, in the colonies, are violated in a substantial way by, inter alia, this Code de l’indigénat and a certain number of other exceptional provisions of colonial law. In your book « De l’indigénat : Anatomie d’un monstre juridique », you introduce the notion of State racism. What can you tell us about this State racism? As far as State racism is concerned, it seems to me to be perfectly established in colonial law which is a racist and discriminatory law, fundamentally based on a representation of the hierarchical human kind and on the thesis -shared by many- that the peoples and inferior races of the Empire cannot be subject to democratic and Republican provisions equivalent to those established in metropolitan France and, moreover, to return to the Code de l’indigénat, we can consider that one of the monuments of this State racism, it is obviously the Code de l’indigénat to which it is necessary add the principle of collective responsibility applied until the Liberation, as well as the administrative detention and a whole series of provisions which, once again, are exceptional provisions which were voted by the parliamentarians under the Third Republic and which lasted until the Liberation and were abolished only then. You also wrote « L’empire des hygiénistes » in which you say that even science was put at the service of colonialism. Why did scientists and writers refuse us to be human and to have a history and a civilization? Indeed, for many contemporaries of the Third Republic, in the late nineteenth and early twentieth century, whether they are scholars, ethnologists, historians, politicians, all or many of them share the same conviction which is the next: Arabs and Muslims certainly belong to a civilization but to a civilization that is considered not only inferior but also dangerous, that is why it is impossible to apply to it institutional, political and legal provisions, equivalent to those which are valid in Europe. That is why it is also necessary to establish a colonial State that we can and must describe as a permanent state of exception with, of course, a number of legal provisions which are consistent with this permanent state of exception. And so, at the heart of all these representations and institutions, there is this conviction of a hierarchical human race, Arabs and Muslims being in an intermediate position, superior to those described as « savages » -and the most emblematic incarnation of the savage at the time is the Black- and obviously inferior to Europeans who think they are at the top of the hierarchy of races, peoples, and civilizations. Algeria often comes back in semantics to designate « the enemy ». In your opinion, has France recovered from its colonial past? I do not think that France is particularly cured of its colonial past. One of the proofs of this is that, compared to other former colonial powers, it’s true for Britain, it’s true for Germany, for a part of the United States, Canada, New Zealand and Australia, and with regard to the unworthy fate of the so-called indigenous populations, France so far, by the voice of the highest authorities of the State, has never truly recognized the colonial crimes committed in Algeria since the occupation of Algiers in 1830, nor did France recognize the colonial crimes committed in all the territories of the empire under the Third Republic, and from this point of view, contrary to the image sought to be given by the political leaders of right and left, in these matters, France is not at the forefront, it occupies on the contrary the caboose. Is not the recognition of the assassination of Maurice Audin by the French Army a diversion of Emmanuel Macron in order to not recognize the suffering of all the Algerian people? With regard to Emmanuel Macron’s recognition of the tragic fate that was actually reserved to Maurice Audin, arrested, tortured, and « disappeared » by military fault, two things must be said: on the one hand, for the Audin family, for the truth and the justice, it is obviously a very important step, remains indeed that one can say that there is, beyond the person of Maurice Audin, tens of thousands, no doubt, of Maurice Audin Algerians, French Muslims of Algeria, for which, for the moment, there is no official declaration of the highest authorities of the State. And besides, the statement of Emmanuel Macron is at the same time contradictory and forgetful. Contradictory precisely because it describes the systematic torture in Algeria, but if it is systematic, then it must be recognized that it has been used much more widely and this would indeed require a general declaration in relation to those who have been arrested arbitrarily, tortured and who are, until now, missing. Moreover, this statement is also forgetful because at no time did those who drafted this text, and Emmanuel Macron, who bears political responsibility, did not use this legal qualification as a « crime against humanity » even though we know that enforced disappearance is indeed a crime against humanity. As far as I’m concerned, I do not think it’s an oversight, it’s a willingness to avoid on the one hand an outcry from the right and the far right, and no doubt also to avoid actions against the French State insofar as one of the essential characteristics of the crime against humanity is to be imprescriptible. In the same week where he recognizes the assassination of our comrade Maurice Audin, Emmanuel Macron pays tribute to the Harkis. I spoke with General Meyer one day and told him that the case of the Harkis was a Franco-French affair and he conceded to me that France had abandoned its soldiers, the Harkis, not intending to embark everyone. Why do the French politicians talk about the Harkis -which only concern France since they are auxiliary soldiers who have chosen France- every time we talk about Algeria? Because, basically, these cases of recognition, from the point of view of Emmanuel Macron and previous political leaders, including François Hollande, are less a concern for truth than a political concern to please a part of their electorate, and not to alienate some French voters, hence the impression that the head of State satisfy some of the left and then satisfied some of the right. Including the Pieds noirs (note: French people of Algeria). And what suffers each time is obviously a more global recognition and a more specific and particular concern for the historical truth and the recognition that this historical truth would imply. That is to say, the victim of this electoral instrumentalization is the historical truth? This is both the historical truth and both those who have been victims of colonial violence, their descendants and the heirs of colonial and postcolonial immigration who are forced to see once again that they are victims of memorial and commemorial discrimination. You are president of the association October 17, 1961 against oblivion; do you think this date is known by the French people? This date is becoming more widely known thanks to the mobilization of numerous associations of political parties and trade union organizations which, on each anniversary date, October 17, and still a few days ago October 17, 2018, is meet at Pont St Michel, but there are also rallies in several suburban towns and in the provinces that do not just commemorate but require that recognitions be made, to demand also the opening of the archives, to require finally the construction of a place of memory in homage to those who were arrested, massacred, tortured and murdered on October 17, 1961, in the preceding days and in the days that followed this sinister date, so that indeed, a part of the public opinion knows what was perpetrated at the time by the French police who acted under the orders of the prefect police of the time Maurice Papon. I never understood why we were called « Muslims » instead of saying « Algerians ». Why did colonial France refuse us our Algerianity and send us back to a confession? For reasons, it seems to me, that are not necessarily simple but are easy to understand. Qualify the indigenous populations of Algerians, as we saw it after 1945, led almost immediately to the recognition of the Algerian people. This is exactly what the leaders of the Fourth Republic, whether left or right, did not want, hence the very singular name of « French Muslim of Algeria », all the more singular under the Fourth Republic that this one had just reminded that it condemned any discrimination of any origin whatsoever, however, the name « French Muslim of Algeria » was intended to distinguish among those who lived in Algeria, a particular category, to distinguish them from the French came from the metropolis and constitute these French Muslims of Algeria as a specific body of exception on which will apply, after the outbreak of the Algerian War, again, alas, provisions and principles of exception, legal and practical provisions of exceptions relating to war and counter-revolutionist. We are here, I think, at the heart of the concept of « State racism ». This is one of the manifestations, indeed, of State racism and which will continue under the Fourth and the Fifth Republic at least until 1962. Is not colonialism an aberration? This judgment may be retrospectively done without doubt, but from the point of view of contemporaries, colonialism was not an aberration for them at all, on the contrary, it was an absolutely essential means, and especially for the founders of the Third Republic and France in particular, to restore France as a great European power because great colonial power and, for them, it was a undertaking to which they were most important because they were convinced that this was the only way to avoid a decadence at the same time economic, social, political, of France, compared to other European States, and they were extremely proud of this since it was the Republicans who allowed France to become the second imperial power in the world. And so, from an economic, political, and geopolitical point of view, for them, it was absolutely not an aberration but a national, international and geopolitical necessity. Why, in your opinion, the lie is structural in colonial history? This is partly because a number of legal provisions and repressive provisions, repressive techniques and warfare techniques are obviously absolutely contrary to republican principles and democratic principles, hence the need, to possibly hide these contradictions, to contrive a great republican imperial narrative which is obviously a great mythological tale and, in the most serious cases, to build what must be called a real State lie. I think of two particularly terrible events: the massacres of May 8, 1945 in Setif, Guelma and Kherrata and, of course, even if the massacres are much less important, the massacre of October 17, 1961, for which will be forged, indeed, what must be called a true lie of State tending to accredit the idea that it is the peaceful protesters called by the FLN (note: National Liberation Front) who bear responsibility for the dead people and to spectacularly reduce the number of Algerian deaths at the time, therefore, to also minimize the responsibility of the State in general and of Maurice Papon in particular. About Maurice Papon, do not you think he’s a criminal against humanity? It must first be reminded that Maurice Papon was indeed sentenced for complicity in crimes and genocide because of his responsibilities during the Vichy period. Concerning October 17, 1961, we must remind and it will be a way to pay homage, that a number of lawyers including Nicole Dreyfus considered that the massacres of October 17, 1961 were a crime against humanity and that in this respect, Maurice Papon bore an overwhelming political, police and personal responsibility and that it was indeed right to consider that he had committed a crime against humanity. The responsibility of François Mitterrand is also established, especially in the case of Fernand Iveton, our comrade who was guillotined. Mitterrand was Minister of Justice at the time and refused his pardon. Is not the whole French administration involved in repressive politics? As regards 17 October 1961, Mitterrand is not in political affairs. Those involved are the Minister of the Interior Roger Frey, Prime Minister Michel Debré, but, you’re right, I do not forget the responsibilities of François Mitterrand as Minister under the Fourth Republic and who said that France extended from Dunkirk to Tamanrasset and, indeed, its responsibility in the execution of a number of FLN militants and, as you mentioned earlier, Fernand Iveton. Today, Algeria, like some other countries, is facing a neocolonialism unleashed; I am thinking of the NATO attack on Libya, the destabilization of Syria, etc. In your opinion, are not all these wars a continuation of the colonial wars? There are indeed phenomena of continuity between France’s colonial past and a certain number of its present military interventions, but there are also phenomena of discontinuity and in a number of African States and former French colonies, which are in an absolutely catastrophic economic, social and financial state, the leaders of these States can not be exempted from their responsibilities. They carry a primary responsibility and one could add that France is often complicit in the state in which these countries are. There is a revisionist current on both shores of the Mediterranean, in France and in Algeria, which wants to exonerate colonialism. Do not you think that these well-known figures continue the work of many intellectuals such as Victor Hugo, for example, by claiming that colonialism was a blessing? How do you explain the return of revisionism in Algeria and France? As far as France is concerned, it must be remembered that this offensive of revisionism in colonial history begins with the law of 23 February 2005, which is a political and legal undertaking of unprecedented rehabilitation of the French colonial past, and remind that contrary to what many still think today, this law has still not been repealed and therefore, we are entitled to consider that this law is a rogue law because it violates basic democratic rights and principles, and in particular a basic democratic principle which is that the State, whatever its nature and especially if it is a State that claims to be democratic, can not and must not intervene in History and even less seek to establish an official version of History in general and colonial history in particular. What do you think of the insurrections of the Emir Abdelkader, the Bouamama, the Mokrani, etc. and my ancestors, the Abdelmoumen, who held the siege of Constantine in 1830? Contrary to the official speech of the political leaders of the time and the military, the pacification of Algeria was not a long calm river, on the contrary, since, indeed, the French political and military authorities did not stop to come up against resistance, insurrections, which prove that, contrary to what is sometimes said, those who were called at the time « the natives » with much contempt were not at all resigned but have sought, whenever possible and in spite of the risks they would incur for their freedom and their live, to oppose the imperial and colonial French enterprise. What does the Algerian Revolution for November 1, 1954 mean to you? This means very clearly that the leaders of the time having acquired the perfectly established and legitimate belief that French colonialism in Algeria would not yield an inch by the peaceful way and the way of negotiations, and that it was necessary to fight this colonialism by force of arms in order to do triumph over what is acquired for the republic but refused to Algerians, namely the right of peoples to self-determination. How do you explain that some resistance fighters against Nazism during the 39-45 war were able to commit, for some of them, the crimes of May 8, 1945, whether they are of left or right? It is indeed quite difficult to understand today, those who had taken up arms against the occupier considered that to defend France, its European authority and its international authority, it was necessary to defend at all cost the French colonial empire in general and French Algeria in particular, which makes it possible to understand why right and left-wing forces, including the Communist Party, have committed themselves to defend the empire at the end of the Second World War, because, once again, by the defense of the empire, it was a question of restoring France as a great European and world power, and of restoring France in the camp of the victors. Should France today not stop supporting African regimes, including the Algerian power, for its own interests, even if it goes against the interests of the peoples? It seems relatively clear to me that in a number of cases of former French colonies led by dictators or authoritarian regimes, France still bears an overwhelming responsibility If only because, for geopolitical, economic, financial and military reasons, France effectively supports these regimes and, once again, mocks the interests of the peoples concerned. Is it a continuation of its colonial past or is it just for geopolitical and economic interest? I think they are the two in the sense that France has privileged relations with a number of States in the Maghreb and sub-Saharan black Africa because they are former colonies and therefore obviously this past is a past that weighs on Franco-African relations, to say it very widely, and furthermore, there are also geopolitical, economic, financial and military issues that determine the maintenance of these relations and support, including military, to notoriously authoritarian and notoriously dictatorial regimes. You are a committed intellectual and a Just, I want to clarify, and a light bearer. Do not you think that your commitment must be a model for the younger generations? Should not they be inspired by courses like yours? I would be careful to not conclude in this way. Each generation must face the problems that they have with the intellectual and political instruments at their disposal. Did you experience pressure in your work? I have not been under any pressure to develop, write and publish books that belong to me. As an anti-colonialist, what can you say to all anti-colonialist and anti-imperialist resisters who resist in the world? May the struggle continue for the right of peoples to self-determination against dictatorships and authoritarian regimes of any kind and for emancipation and against exploitation. Who is Dr. Olivier Le Cour Grandmaison? Olivier Le Cour Grandmaison is a French political scientist and historian specializing in citizenship issues during the French Revolution and issues related to colonial history. He is Professor of Political Science at the University of Evry-Val d’Essonne and has directed and led several seminars at the International College of Philosophy. He is president of the association « 17 octobre 1961 : contre l’oubli » which advocates the official recognition of crimes committed by the Fifth Republic during the massacre of peaceful Algerian demonstrators on October 17, 1961 in Paris. He is also a judge-assessor appointed by the Office of the United Nations High Commissioner for Refugees (UNHCR) at the National Asylum Court (CNDA). Moreover, it belongs to the Support Committee of the Primo Levi Association in Paris which is a centre of care and support for people who are victims of torture and political violence. Dr. Le Cour Grandmaison is the author of several books among which Les Citoyennetés en Révolution (1789-1794) », Paris, PUF, 1992 ; « Les Constitutions françaises », Paris, La Découverte, 1996, « Haine(s) : Philosophie et politique », Foreword by Étienne Balibar Paris, PUF, 2002 ; « Coloniser, exterminer. Sur la guerre et l’État colonial », Paris, Fayard, 2005 (edited in Arabic in 2007, Algeria) ; « Le Retour des camps ? Sangatte, Lampedusa, Guantanamo » avec G. Lhuilier et J. Valluy, Autrement, 2007 ; « La République impériale : politique et racisme d’État », Paris, Fayard, 2009 (édité en arabe en 2009, Algérie) ; « Douce France. Rafles, rétentions, expulsions », collective, Le Seuil/Resf, 2009 ; « De l’indigénat. Anatomie d’un « monstre » juridique : le droit colonial en Algérie et dans l’empire français », Paris, Zones/La Découverte, 2010 (edited in Arabic) ; « L’Empire des hygiénistes. Vivre aux colonies », Paris, Fayard, 2014. Cette entrée a été publiée dans In english et taguée Algeria, Bugeaud, colonialism, France, imperialism, November 1 1954, Olivier Le Cour Grandmaison.